This versatile painter's and decorator's tool can be used for a variety of professional and household applications. 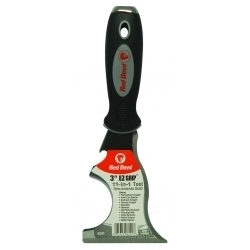 Uses include: scraper, spreader, gouger, hammer, rake, opener, linoleum knife, putty remover, paint roller cleaner, nail setter and nail puller. Make permanent repairs to walls and ceilings. Simply place the patch over the hole and cover area with ONETIME® Lightweight Spackling. Provides fast, professional results.